LJ45 is the ICAO designator for the Learjet 45 and Learjet 45 XR jets. LJ45 is primarily used by air traffic controllers to identify the aircraft in flight. 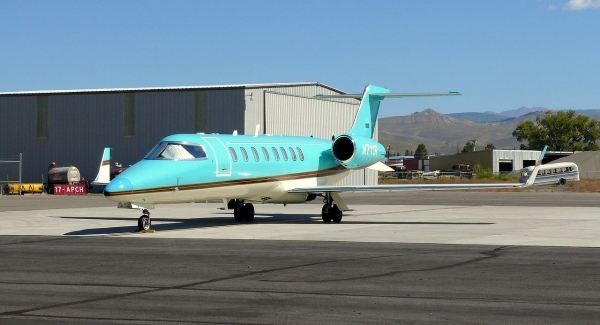 LJ45 is also used by the FAA to identify the Learjet 45 aircraft. To Learn more about the LJ45 jet visit the other Learjet 45 and Learjet 45 XR pages on the website. LJ45 Training - Information on the available training options for the LJ45 aircraft. LJ45 Operating Costs - Learn about the operating costs of the LJ45 jet. LJ45 Performance - Information on the performance of the LJ45 airplane. LJ45 APU - Learn about the LJ45's APU (Auxiliary Power Unit). LJ45 Specifications - Detailed Specifications for the LJ45 aircraft. LJ45 For Sale - Information on LJ45s for sale. LJ45 Dimensions - Detailed LJ45 Dimensions information. LJ45 Charter - Learn about LJ45 Charter operators. LJ45 Avionics - Information on the LJ45 avionics suite. LJ45 Cockpit - Flight Deck: Find out more about the LJ45's cockpit - flight deck. LJ45 Interior - Cabin: Information on the LJ45's Cabin - Interior. LJ45 Engine - Details on the LJ45's Engine. Above: Photo of a LJ45 Aircraft.